More on the Lucasey Ribbed Ceiling Flange for 1 1 4 inch ID Pipe CMASF125 below. 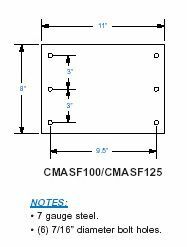 Lucasey's CMASF100 ribbed ceiling flange is compatible with 1.25" ID pipes. It is recommended for installations requiring three or more feet of additional pipe.